Aura Kitchens and Cabinetry is a reputable custom designer and manufacturer of cabinetry. Proudly, we have earned our reputation by being passionately committed to exceeding our customers’ expectations. Custom cabinetry is highly personal and each piece is original and reflective of the distinctive tastes and requirements of its owners. Our cabinetry is individually tailored and engineered to follow premium quality woodworking and architectural standards. Our manufacturing capabilities, kitchen remodelling skills and design philosophy push the technological, styling and ergonomic envelope creating a precise, functional and beautiful final product. Custom cabinets can give your home an added touch of elegance and make you love where you live. When people think of cabinets, they often think of the kitchen. The kitchen is where we spend most of our time, and this room provides an inviting space for guests to come together for conversation. Certainly cabinets are central to kitchens – but they’re also a key feature in bathrooms and just about any other room in your house – and they are often the basis on which first impressions are made. Therefore, not just any cabinets will do. And when that elegant look is the one you desire for your home, trust aura Cabinets to craft and install custom cabinets for you. 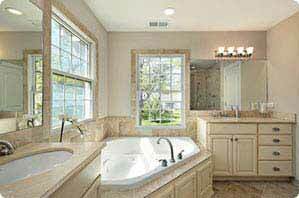 Aura designs, manufactures and installs truly custom cabinets. This means that: We meet with you either in your home or in our showroom show you the options, and allow you to pick what you like. We take precise measurements to make sure your new custom cabinets will fit seamlessly in your home. We manufacture your cabinets and treat them right here in our state-of-the-art manufacturing facility in Mississauga. We professionally install your new cabinets for you, and always leave a clean job site when we are done.